For more information on our available services, please visit the Fees and Services Tab. All available home inspection times are on our calendar. Click below to get started! Click the following link to view a SAMPLE REPORT of a home inspection. 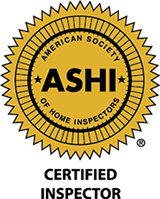 Our inspectors are ASHI Certified and have a combined total of over 13,000 inspections in their careers. VBInspect.com mainly serves the Greater Pittsburgh Area, however we do travel to surrounding areas in Allegheny, Armstrong, Beaver, Butler, Washington, and Westmoreland Counties.